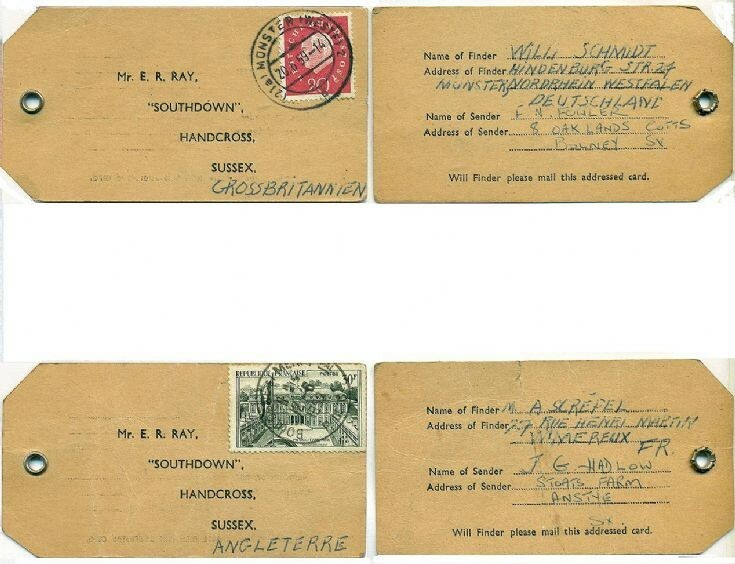 At a Handcross fete or flower show in 1959 there was a balloon race and above are copies of two of the tickets which made it to the mainland of Europe. I have no record of how many others were returned. The first balloon ticket flew over Belgium and came down in the North Rhine area just north of Cologne in West Germany a distance of some 310 miles. The other ticket made it across the Channel but only to Wimereux just outside Boulogne. The value of the postage stamp may seem expensive at 30 francs, but in 1960 the currency was revalued with each new franc (NF) being worth 100 old francs. It seems most likely that Mr(s) F. N. Fowler from Bolney won the prize, but it is only right and proper that Willi Schmidt should receive an honourable mention. Select Open Document to view two documents. The first is a newspaper cutting reporting on the local Conservative Association fete at Truckers Hatch in 1956. This is followed by the Handcross Flower Show catalogue from 26th July 1980.